Born in Canada, Michael J. 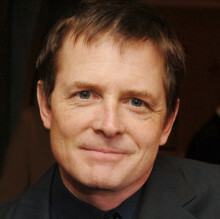 Fox is an award-winning television and film actor who has created characters audiences have fallen in love with: Alex P. Keaton in Family Ties, Marty McFly in “Back to the Future,” Michael Flaherty in “Spin City,” and appearances in FXs “Rescue Me,” to just name a few. Fox was diagnosed with Parkinson’s disease in 1991 and shared the news with the public in 1998. Since then he has assumed the role of advocate, dedicating himself to bringing awareness to Parkinson’s disease. In 2000 he founded The Michael J. Fox Foundation for Parkinson’s Research, which has funded more than $126 million for Parkinson’s research to date. In his new book, “Always Looking Up, The Adventures of An Incurable Optimist,” Michael reveals the remarkable lessons he has learned, and about the hard-won perspective that helped him see challenges as opportunities. His best-selling 2002 autobiography, “Lucky Man,” has been translated into seven languages, and the audio version received a 2002 Grammy award nomination. Fox remains in demand as an actor and hockey fanatic. Do you want to hire Michael J. Fox? Directly request a quote. In 48 hours we can send you the availability of Michael J. Fox If you would like to book Michael J. Fox, Entertainment Booking Agency is the right place. We will offer you the best price and contact the management or we directly contact Michael J. Fox. For corporate appearances or speaking engagements you can contact our agents and the will help you true the process. Tags: hire Michael J. Fox, Michael J. Fox booking, book Michael J. Fox, Michael J. Fox appearances, find more information on booking Michael J. Fox for appearances, Michael J. Fox speaking engagements, Michael J. Fox endorsements/spokesperson, Michael J. Fox appearance fees, Michael J. Fox booking agency contact info, biography of Michael J. Fox, Contact an artist booking talent agent find a speakers bureau that can book Michael J. Fox, speaker booking agency for Michael J. Fox, Michael J. Fox booking agency, Michael J. Fox booking for corporate event. EBA is one of the biggest entertainment booking agencies in the World. We book hundreds of celebrities, artist, athletes and speakers in a year. Important to know is that we are not claiming to be the management of Michael J. Fox. We are not the official agent for Michael J. Fox. Companies from around the globe book these artists and speakers true our company be course we have one of the biggest networks and we always have direct contact with the artist or the management. We help you to find the right celebrities for your corporate of private events. Please contact one of our agents to get free advice and we will help to get the world-famous artist on your party.